Former Secretary of State John Kerry is meeting with for foreign leaders to save the Iran nuclear deal, according to a source briefed on the meetings. In order to preserve the nuclear deal with Iran that he helped negotiate, Kerry has met with foreign leaders like German President Frank-Walter Steinmeier and French President Emmanuel Macron, the Boston Globe reports. 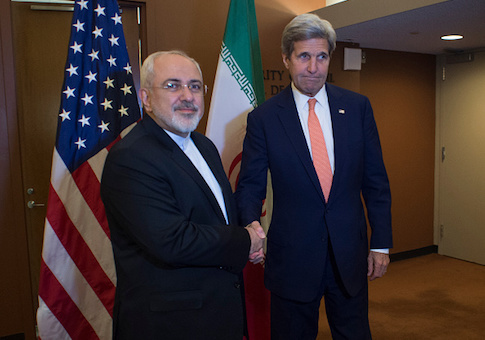 The Globe also reports Kerry met his former counterpart Iranian Foreign Minister Javad Zarif at the United Nations. He sat down at the United Nations with Foreign Minister Javad Zarif to discuss ways of preserving the pact limiting Iran’s nuclear weapons program. It was the second time in about two months that the two had met to strategize over salvaging a deal they spent years negotiating during the Obama administration, according to a person briefed on the meetings. Kerry's lobbying comes as Trump considers whether the United States will pull out from the deal or stay in. The deadline for the decision is May 12. Trump is expected to pull out from the deal after senior Trump administration officials confirmed the findings reported by Israeli Prime Minister Benjamin Netanyahu as authentic and praised the Israeli prime minister for disclosing thousands of secret documents proving Iran lied about its past work on a nuclear warhead. Officials told the Washington Free Beacon the revelation was a "powerful presentation" by Israel outlining why the Iran deal must be fixed or killed. Kerry and other former Obama officials, including former Secretary of Energy Ernst Moniz, are not only lobbying foreign leaders but also members of congress, according to the Globe. Kerry and Moniz met in February with Ryan, who has been outspoken in his opposition to the Iran deal. Kerry also held a breakfast briefing last week with members of the House and Senate, which was designed to answer questions as well as underscore how, if Trump pulls out, Europe could hold the deal together. Kerry continues to believe the Iran deal is working. "Every detail PM Netanyahu presented yesterday was every reason the world came together to apply years of sanctions and negotiate the Iran nuclear agreement — because the threat was real and had to be stopped," Kerry wrote on Twitter Tuesday. "It’s working!" This entry was posted in National Security and tagged Iran Nuclear Deal, John Kerry. Bookmark the permalink.